Exploring opportunities to connect clinical providers and evidence based chronic disease prevention strategies that are community-based is the focus of this group. This topic explores the complex issues that arise related to health insurance, challenges that exist in community engagement, and strategizes on cost-saving interventions that will address chronic disease in communities. 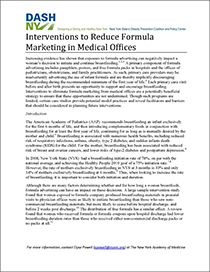 DASH-NY produced a report on Interventions to Reduce Formula Marketing In Medical Offices, together with the New York State Obesity Prevention Coalition and Policy Center. Increasing evidence has shown that exposure to formula advertising can negatively impact a woman’s decision to initiate and continue breastfeeding. A primary component of formula advertising includes pamphlets, posters, and free formula packs in hospitals and the offices of pediatricians, obstetricians, and family practitioners. As such, primary care providers may be inadvertently advertising the use of infant formula and are thereby implicitly discouraging breastfeeding during the recommended minimum of the first year of life. Each primary care visit before and after birth presents an opportunity to support and encourage breastfeeding. Interventions to eliminate formula marketing from medical offices are a potentially beneficial strategy to ensure that these opportunities are not undermined. Though such programs are limited, certain case studies provide potential model practices and reveal facilitators and barriers that should be considered in planning future interventions. 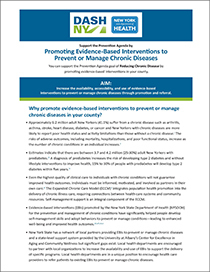 The Evidence Based Interventions (EBIs) fact sheet by DASH-NY focuses on promoting evidence-based interventions to prevent or manage chronic diseases at the county-level. Evidence-based interventions for the prevention and management of chronic conditions have significantly helped people develop self-management skills and adopt behaviors to prevent or manage conditions—leading to enhanced well-being and improved health outcomes. The NYS Department of Health has made Evidence-based interventions one of four priority strategies for preventing chronic disease. The Sustainable Partnership and Coalition Building webinar explored the opportunities and challenges of utilizing multisector partnerships and coalitions as important tools for eliminating health disparities, organizational factors that can make existing partnerships and coalitions more effective, and best practices for creating them.